More than 1000 villages have gone solar, with at least 450,000 homes electrified and now relying on solar instead of kerosene and wood. October 9, 2015—In developed countries solar is a lifestyle choice for households. In developing countries, such as India and Africa, it is a need! People from small, poor villages know nothing of being connected to an electrical grid. In these villages, people struggle to find resources for light, using kerosene or wood, both of which emit thick fumes and cause poor health, air pollution, fire hazards and deforestation due to their wood burning stoves. But things are changing! In India, women are traveling to a place called the Barefoot College to learn how to solarize their villages. And solarizing their villages means more time for people to do other things, such as growing gardens, creating small businesses and time to work towards an education. Communities working with the Barefoot College have replaced from 50-100% of their kerosene lamps with solar power lights! In 1972, Bunker Roy, now 70, started addressing the needs of India’s drought stricken villages, but in the 1980’s he broadened his school to encompass sustainability and inequality of women. He has continued this path with his school, the Barefoot College. Roy has been named Time Magazine’s 100 most influential people of the year in 2010, plus one of 50 environmentalists who could save the planet by the Guardian! 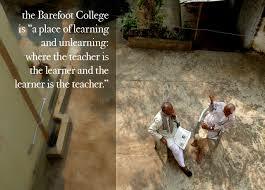 Barefoot College is located in Tilonia Village in Rajasthan, India. The college is made up of environmentally friendly, dome-shaped buildings on 8 acres of land which were built by the students. Barefoot College is based on Gandhi’s ideas of lifestyle and work–it has dirt floors and no chairs to help people feel at home and comfortable–a college exclusively for the poor! Roy’s philosophy is that each village should be self-reliant. This is based on Gandhi’s “Swadeshi” philosophy, which means local self-sufficiency. 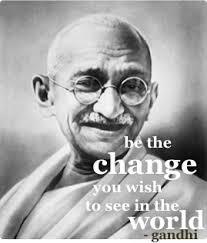 Gandhi’s Philosophy: The small villages must be empowered. Only a small part of Gandhi’s struggle was to end British colonialism. The greater part was to renew India’s culture and spirit. After the British were driven from India, Gandhi wanted India’s government to surrender much of its power to local villages. 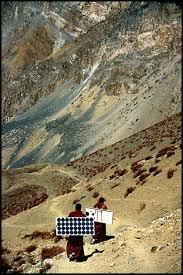 “The true India is to be found not in its few cities, but in its seven hundred thousand villages. If the villages perish, India will perish too.” Swadeshi was a program for long-term survival of these villages. And, thus, the philosophy of the Barefoot College, so named because it is committed to the poor inhabitants of small, country villages in India. How does learning solar at Barefoot College work? A Barefoot team looks for villages in India (it has also been extended to Africa and other countries) with people living on less than $1 a day. The village must commit to solar by allowing two grandmothers (yes, grandmothers!) to attend the Barefoot College for 6 months of solar training. These middle-aged women are chosen because they have strong roots in the community, and they are unlikely to migrate to bigger cities, as younger people in the villages might do. If Barefoot College puts the effort into training someone, they want them to stay in the village and facilitate any work necessary to maintain the solar systems–they don’t want to lose the people they have trained! The women chosen as solar engineers do not need educational qualifications to attend Barefoot College—they don’t even need to know how to read or write! One hundred women solar engineers are trained at Barefoot College every year, learning how to hook up solar to electrify homes, solarize hot water heaters and cookers, and solar power the desalination of drinking water. 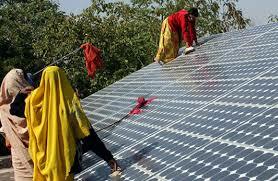 They receive a small monthly salary from their village for maintenance and repairs to the solar systems. The solar engineers also can connect solar to schools, hospitals, community centers and other facilities. And the added benefit to our planet–they are reducing air pollution! Using this method of education, more than 6,525 villagers have been trained. not only in solar, but in areas such as building homes and harvesting rainwater. Also, more than 1000 villages have gone solar, with at least 450,000 homes electrified and now relying on solar instead of kerosene and wood. The long term effect of training solar engineers? Not only does it boost the self esteem of the women trained, it has given people in the villages the opportunity to work and study into the night, start small businesses that continue after dark, and provide computers and televisions in community centers, along with many other benefits! So, thanks to Bunker Roy and the Barefoot College for making Planet Earth a healthier place to live! Categories: Climate Change, Energy Programs, Fossil Fuels, Poverty, Solar, Sustainable Education | Permalink.